We're pleased to welcome you to the brand new Lorne Park Dental website. We wanted a website that reflects the straightforward, easy-going nature of our practice; we hope you like it! 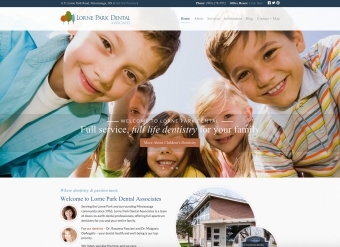 Everything you need to know about Lorne Park Dental is just a few clicks away on this easy-to-navigate site. Plus, it's fully responsive, meaning you can find all the information you need, no matter what devices you're using. So, take a look around. If you'd like to know more about our practice, pay a visit to our About page, or get to know our Dentists and the rest of the Lorne Park Team. Or, you can learn all about the services we offer by visiting Our Services. And of course, if you'd like to get in touch, feel free! Whether you have some feedback about our new site, or if you have questions for our team about our dental services, we'd be happy to hear from you.